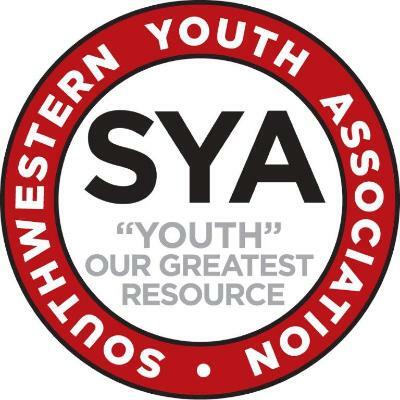 Sign Up Today for Summer Sports, Spring Multi-sport Clinic and Read the Latest News from SYA! SIGN UP TODAY FOR SUMMER SPORTS! It's once again time to register for summer SYA sports! Our summer sports are basketball, travel basketball, rugby and track & field ! Registration for travel basketball will take place after tryouts are held and a child is selected to a team. When you register your child, you will notice that SYA has a new registration system. We are excited to begin working with Demosphere who will now provide our database and registration services. To begin the registration please click here to set up your new SYA Family Account. From there, you can select a sport and register your child. Register for Summer Basketball today! SYA summer house league basketball is played in Centreville/Clifton air- conditioned gyms on weekdays in June and July. The league is for rising 1st through 12th grade boys and girls. SYA summer travel basketball is for the more competitive player. Games are played throughout the county on weekdays in June and July. The league is for rising 5th through 8th grade boys and girls. Registration for travel basketball will take place after tryouts are held and a child is selected to a team. Tryouts for summer travel basketball will be in May. Please check the SYA Travel Basketball webpage for more information. Keep kids involved this summer in team sports! 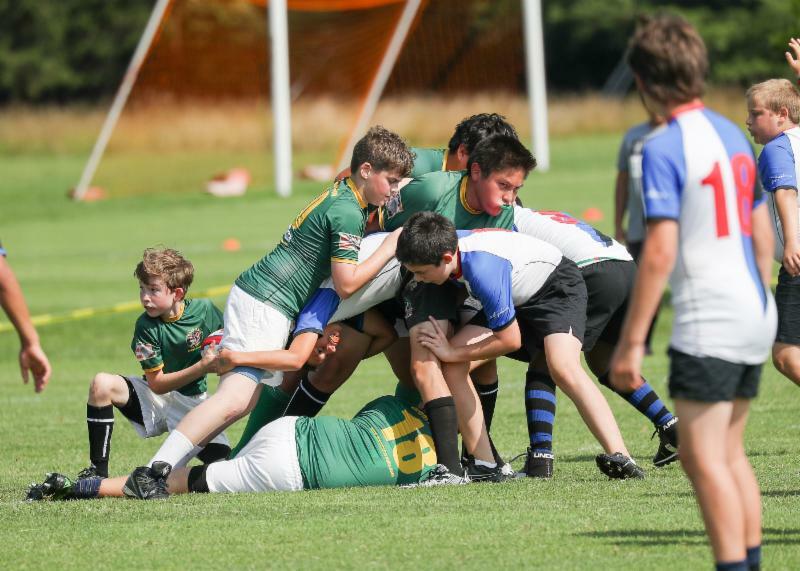 Try something new with SYA Rugby which provides fast-paced excitement during the summer months. No experience necessary, the season is June through July and we encourage families to enjoy summer vacations as needed! The two-hand touch variety of the game, called “Tag”, is rugby for boys and girls in K through 4 th grade . Two-hand touch is a fun and exciting form of non-contact rugby that requires no prior knowledge of the game – just a willingness to learn and have fun! 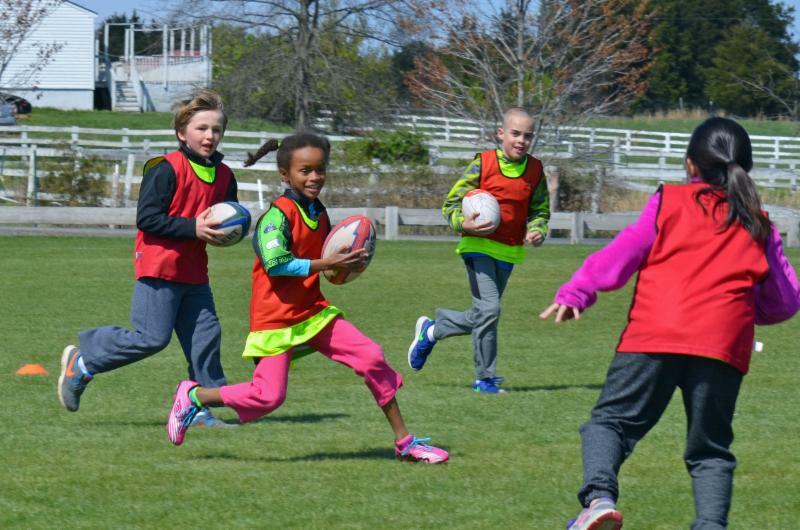 Tackle rugby is for boys and girls currently in 5th-8th grade who are ready for the more physical, traditional form of the game. At SYA, we teach the “shoulder leverage tackle” method, a technique which takes the head out of the tackle and is rapidly being adopted by football programs to teach better tackling and help avoid injury. 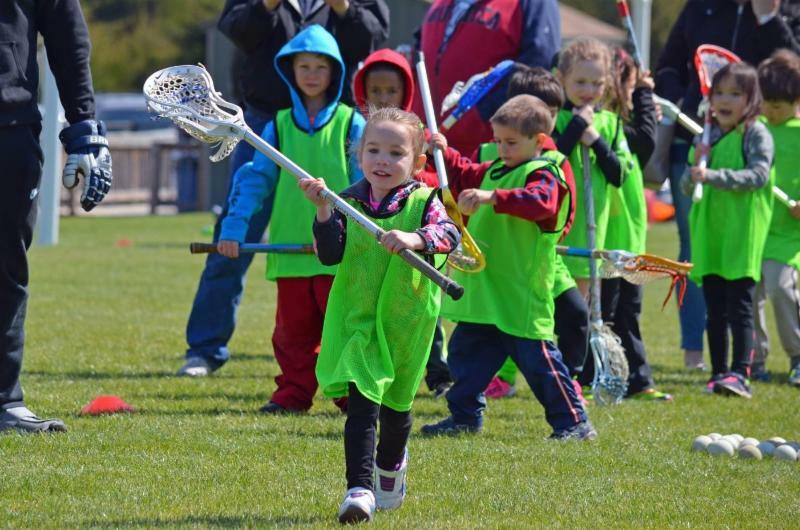 Playing either version of the sport is an exciting opportunity for boys and girls to get outside and stay active, be exposed to a seriously fun activity in a competitive environment, develop abilities that will carry over to other sports, and develop positive character attributes. LEARN MORE at (a) Special Rugby Interest Meetings ( coming soon! ), (b) SYA Multi-Sport Clinic (April 28), (c) Facebook page, or (d) SYA Rugby web page . Stay in shape! Increase your endurance and strength! Improve your running posture for efficiency and effectiveness. 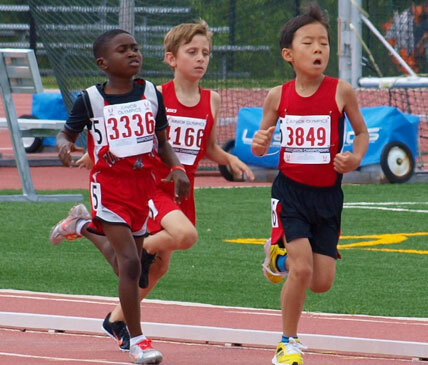 Summer track and field organizations offer local Olympic style competition for the future young stars of the DMV. In concert, SYA track & field provides a unique opportunity for our kids in rising grades 1-12 to challenge themselves, compete, increase their track & field acumen and improve their overall physical fitness. Run, jump, and throw! Everyone starts, everyone finishes! Volunteers and coaches: While no experience is necessary, it's always nice to have the wisdom of experienced ex-athletes to help guide us. Sign up today! 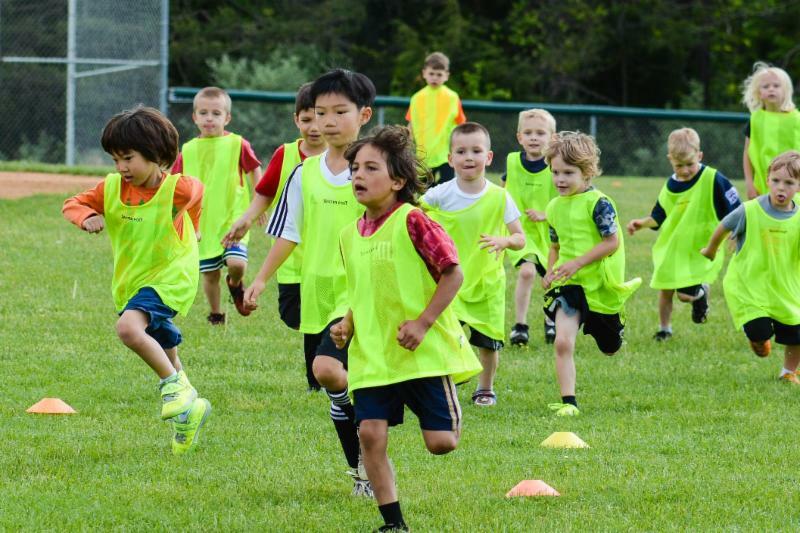 SYA announces our next much-anticipated multi-sport clinic. This FREE event is for boys & girls in grades K-6. Your child will spend 10-15 minutes with each sport, playing fun games in a variety of sports both indoors and outdoors, on courts, on padded mats, on the pitch, on the diamond and everywhere! Different sports, different interests, different times of year....find one that fits you! Dress in athletic clothing, comfortable shoes and bring a water bottle. Clinic registration is free; sign up online here. 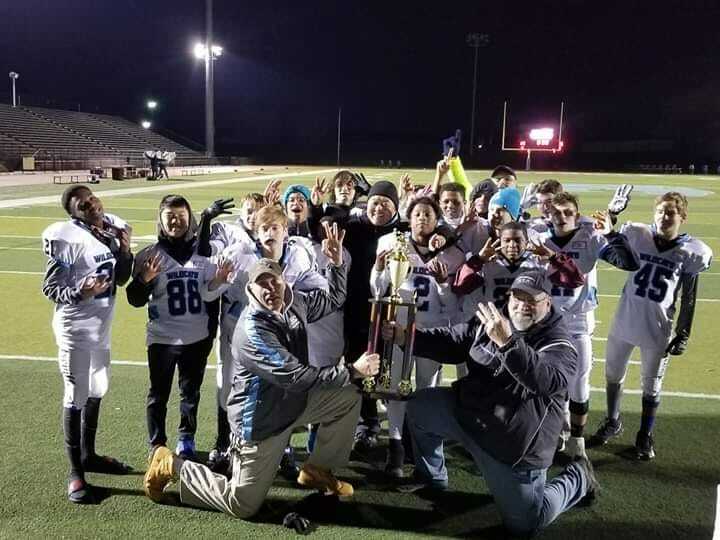 Sport Spotlight: SYA Tackle Football Champions! 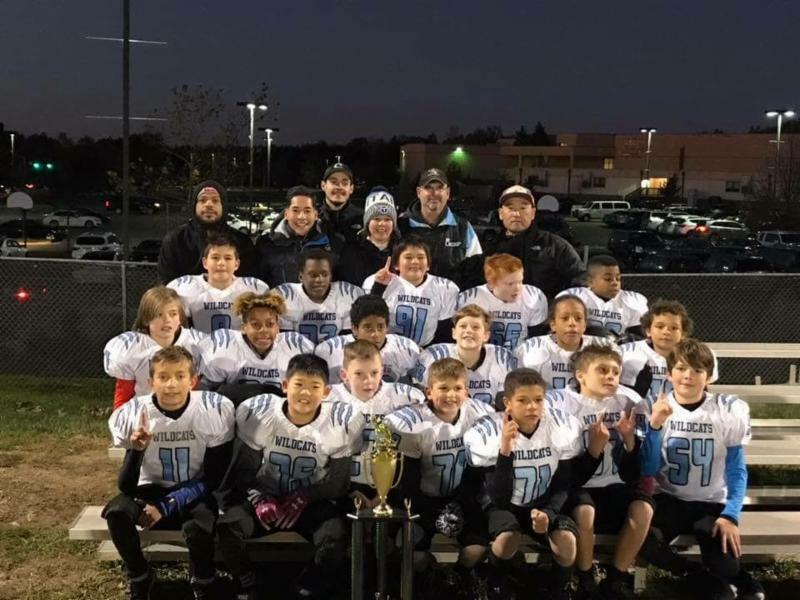 SYA Tackle Football completed its best season ever this past fall!. SYA fielded 10 teams ranging from AnkleBiters to 130lb American. Every team competed hard throughout the season and we finished the year with 8 of 10 teams making the playoffs. Centreville HS was selected as one of four primary locations to host Championship games. Of our 8 playoff teams, 4 advanced to the Championship weekend. At the end of the day, SYA stood above all other leagues with 4 County Championships. SYA has never gone undefeated on Championship weekend. This is a testament to the coaching, parents, and players who come out in August and work hard all season long. SYA also is taking home hardware in the post-season. AnkleBiter Coach of the Year of Fairfax County is Boomer Deconti and 115lb American Player of the Year is Donovan Mullins. Additionally. Coach Bang completed a 3-peat, winning at 80 American, 90 American, and 115 American. 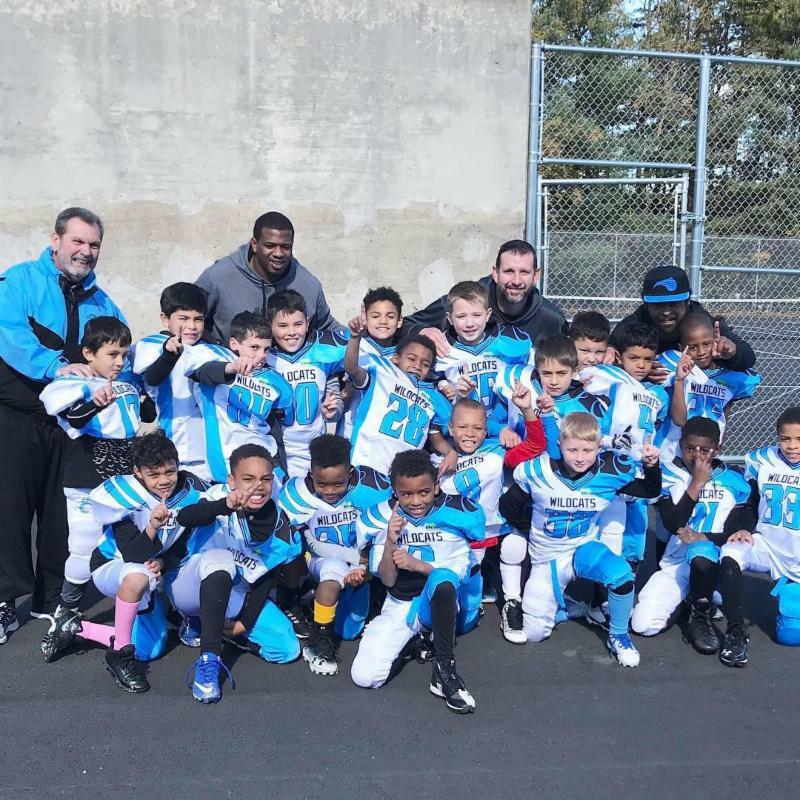 SYA Tackle Football focuses on teaching the fundamentals of football beginning at the age of 7 and continuing up to age 16. SYA competes along with 23 other organizations with over 400 teams in Northern Virginia. FCYFL is organized by an age/weight and skill matrix to ensure players are playing against other children of similar size and skill. SYA was one of two pilot programs selected by USA Football and the NFL to introduce Heads Up Football. Commissioner Goodell along with NFL Films attended SYA Heads-Up clinics in the summer of 2012. SYA continues to be at the forefront of player safety and has invested in the latest equipment and training for our coaches. On January 23 rd and 24 th , SYA Little League Baseball/Softball hosted ‘Baseball Days” at Union Mill Elementary. Nine SYA coaches and two Union Mill alumni volunteered their time to teach nearly 1,000 students a host of baseball skills. 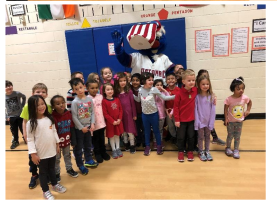 In conjunction with the Union Mill staff, the students received detailed instruction and were able to showcase their hitting, throwing and catching skills. The Potomac National’s Uncle Slam made a guest appearance. The gym was filled with lots of smiles and enthusiasm for the sport during the two-day event. Our thanks to the entire Union Mill staff especially Ms. Murray and her team of very patient physical education teachers. The 10th annual Baseball/Softball clinic was held at Willow Springs Elementary January 22nd through January 24th. Approximately 920 students experienced the joy of baseball/softball through 4 stations: hitting, fielding ground balls, catching pop ups, and throwing. (We missed another 110 students due the 2 hour delay on Tuesday.) Shout out to Mr. Taylor, Mr. Silvis and Mr. Burda for allowing us to come into the Willow Springs PE classes for this event. A special thanks to all our volunteers : Phil Bettwy, Dean Canestra, In Cho, Morgan Estabrooke, Rob Estabrooke, Doug Hownestein, Laura Kehoe, Mark Kirley, Chris McDonald, and Pete Naka. Most of the volunteers do not have children at Willow Springs, but wanted to share their passion for baseball/softball with the next generation. 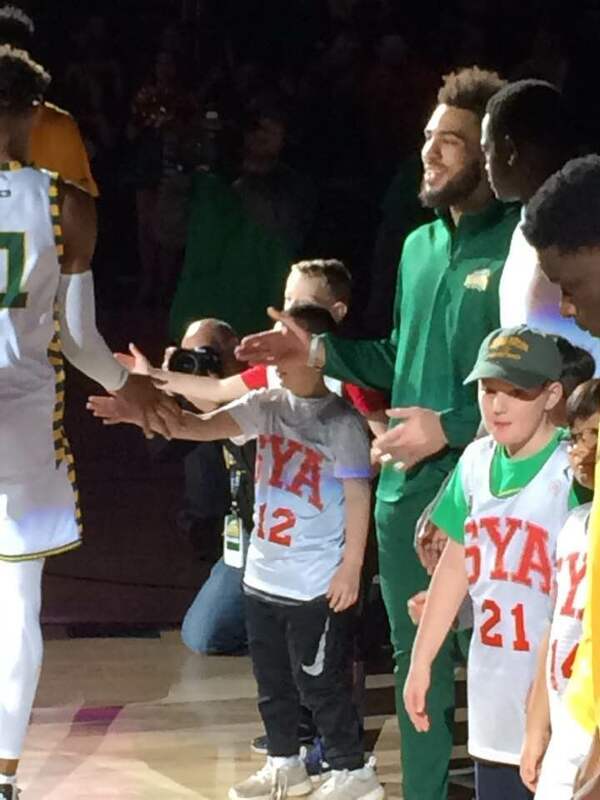 On January 9th and February 27th, George Mason Men's Basketball invited the SYA community to special SYA Nights. 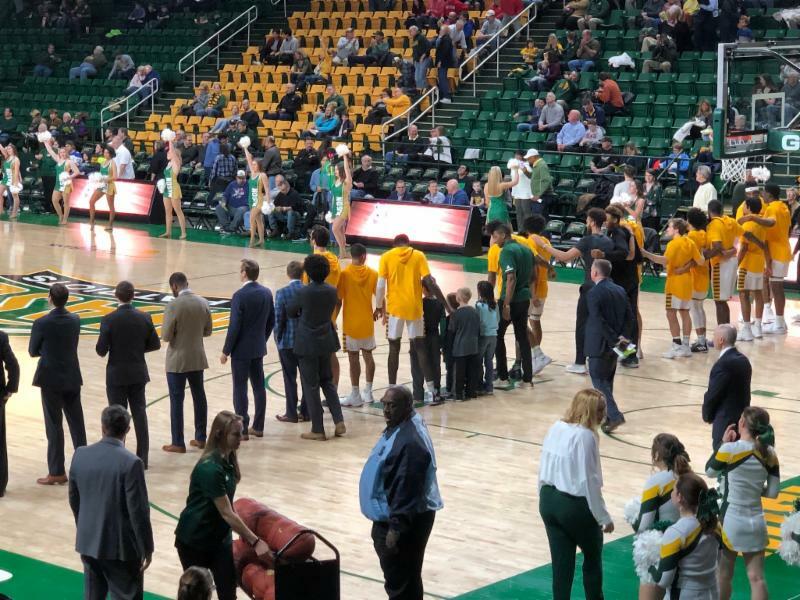 Over 45 SYA members attended the games and some of the lucky players were chosen to High Five the players as they came out of the tunnel and then stand on the court with the GMU Players during the National Anthem. Great time was had by all! Thanks and Go Patriots! SYA is fortunate to have two Board members that have been appointed to the FCAC. Gary Flather is the Sully District Representative and Jeff Stein is the Town of Clifton Representative. They provide the SYA Board of Directors and through this newsletter, our membership with recent activities of the Council. At the last Council meeting the Neighborhood and Community Services (NCS) offices shared information about a Symposium on Mental Health and what role Coaches, Parents and Administrators can have on players. The Fairfax County Sports Tourism Task force group reported that the findings of the Task Force are being shared with the Fairfax County Economic Advisory Council this month. The Athletic Council is excited about the possibilities of our County jumping into the multi-billion dollar industry of Sports Tourism. Please visit the Fairfax County webpage for more information. Patriot Park North (new diamond development near Willow Springs Elementary currently referred to as LLV) – plans are currently in place to begin construction at the end of 2019. Currently there are two 60’ lit diamonds and one 90’ unlit diamond. The completed park with have two 60’ lit TURF diamonds and four 90’ lit TURF diamonds. This will be the first multi 90’ diamond complex in the area. F.A.S.T – this acronym stands for Fairfax Athletes Stand Together. It is a program designed to help Fairfax County citizens in need with donations of food and essential items and one that SYA participates in regularly. To date, SYA has collected several THOUSAND pounds of food and essential items that are distributed amongst the many shelters throughout Fairfax County. Look to our website for our next event. The Sports Park is currently closed for the winter. Preparations are in place to open the Park in March. We are working hard to open the Snack Bar at the Park at least on weekends (Sat/Sun). The SYA Sports Park is owned and operated by you , the member. 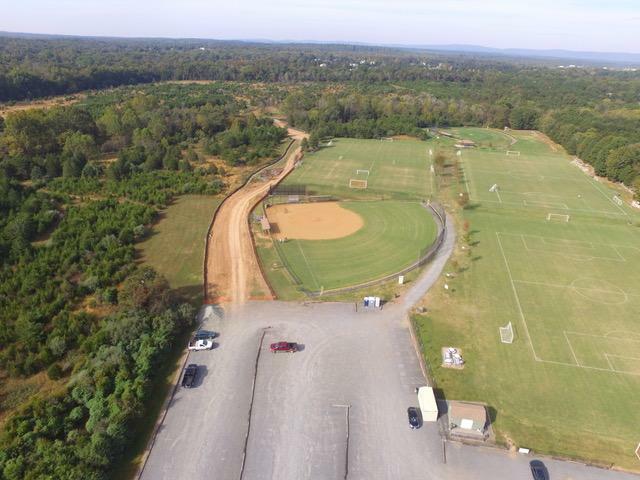 We have 110 acres of property with 5 ball fields already in place. We have a snack bar, two 60’ diamond fields, three full size rectangular fields, a covered pavilion, picnic area, a cross country trail and a fitness trail. If you have not had the opportunity to play on one of the fields, please come out to 6626 Bull Run Post Office Road and visit! See our website for more information. Special discount for SYA families! Mark your calendars for savings! Thanks to Modell’s, SYA families will enjoy 15% savings on purchases made between now and March 28. 2019. Great for spring and summer sports gear shopping! 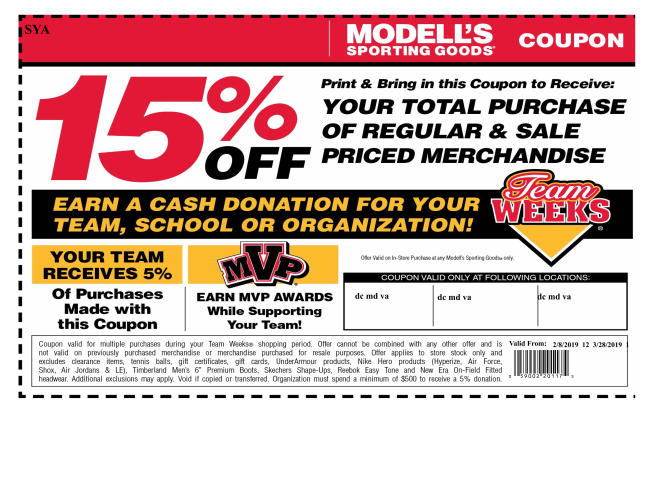 While YOU save 15%, Modell’s will send the SYA organization a 5% rebate! You win, we win, we all win! Are you a high school student who needs community service hours? If so, please contact the SYA office at admin@syayouthsports.org for possible opportunities! Please visit us for more information at www.syasports.org. The Fairfax County Police Department would like to remind the SYA community to please secure your vehicles and valuables at athletic fields! Please visit us for more information at our website. AMAZON SMILE – here is an easy way to shop and donate to SYA! SYA is now a registered organization in the Amazon Smile program. Amazon Smile is a simple way for you to support SYA every time you shop, at no cost to you. When you shop at smile.amazon.com, you will find the same prices and selection as Amazon.com with the added bonus that Amazon will donate a portion of the purchase price to SYA. SYA has teamed up with INOVA to give out SYA membership priority access to appointments with the physician-based team of specialists from the Inova Sports Medicine Concussion Program. Have questions or need to schedule an appointment? 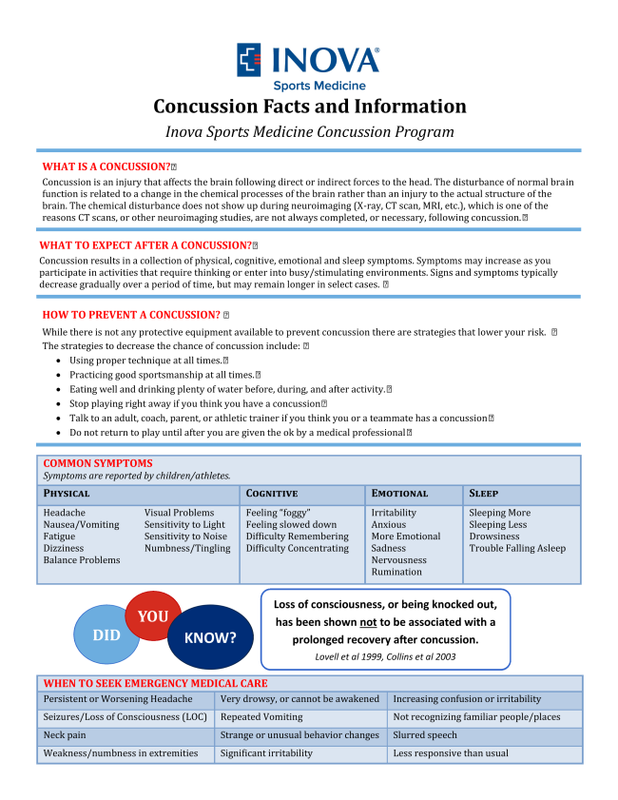 Contact the 24/7 concussion hotline at 703-970-6427. Wish your player good luck! Let your player know you will be proud of him or her no matter how well he or she plays. Take a moment to remind yourself of the true meaning of youth baseball, to have fun. Tell your player to have fun and enjoy the game! Let the coaches coach. It is inappropriate for parents to address playing time, team strategy or play calling with the coach. Encourage your player, teammates, and the opponent by cheering for them. You can help your child learn the importance of sportsmanship by talking with them about what it is, and then showing them what it is when you're cheering for them in the stands. Pay attention to the game, but keep perspective! At the end of the day, baseball is just a game, it's supposed to be fun and enjoyable for everyone involved. Thank the coaches for their commitment to the team. Congratulate your player on a great game—no matter how he or she played. Resist the urge to turn the car ride home into a postgame critique; instead, ask your athlete later about the play and get their thoughts on it. By allowing some time to pass following the competition, and enabling your child to talk about their mistakes, it promotes a greater understanding of the game and a more positive family dynamic. Remind your player that you are proud of him or her! How Can Parents Best Prepare Their Child to Perform Before a Game??? 1) Know your athlete : is your child self motivated, focused, lazy, competitive, intimidated, aggressive? All of these will dictate how much of a pre-game pep talk they need. Some kids rise to the occasion every game and don’t need a reminder to focus. Others need a gentle push. Still others will resist any suggestions parents give them on the way to a game. So choose wisely. 3) Ask your child how they like to get focused : some kids like to listen to music on the car ride to a game, some like to play video games, some like to just talk with friends, others like to talk strategy. Ask and observe what seems to get them most focused. It might not be what you think….and it might not be the same thing that gets you focused. 4) Set goals : It’s great to talk about your child’s goals before a game, but only if they are part of a holistic approach to player improvement. Asking your child to score two goals in a soccer game is not a goal….rather, that’s putting pressure on the child. Instead set goals at the beginning of the season that are tied to skills and a mindset of pushing your comfort zone. Especially for the younger players, set goals such as trying a new move or taking on a defender in a one-on-one situation. These are goals that can be discussed in the car ride to the game without stressing a kid out. Finally, at iSport360 we believe in close collaboration between parent and coach . That’s why we created a mobile platform for coaches and parents to set goals for their kids, share ongoing feedback and conduct fair player evaluations. Point being: if your pre-game conversation with your child is contrary to the coaches pre-game conversation with your child…..you have a BIG problem. I remember coaching my daughter’s u9 soccer team and experiencing this problem. A young midfielder on the team had great ball handling skills and an aggressive spirit. Before each game I coached her to take a few touches and then release a beautiful through-pass to her strikers. Unfortunately, in the car ride to each game, her parents were telling her to try to dribble through all of the defenders and score 3 goals. The result was a confused and stressed player who had to decide whether to listen to her coach or parents each game. Sad. So let’s get parents and coaches on the same page…for the pre-game conversation…and throughout the season.